This morning I came very close to causing grievous bodily harm to an elderly lady and her grandchild that came between me and what appeared to be the last two chocolate bilbys in Sydney. Years gone by you couldn't move without knocking the buggers down but now that I have my two English in-laws in town for Easter I couldn't find them for love nor money. 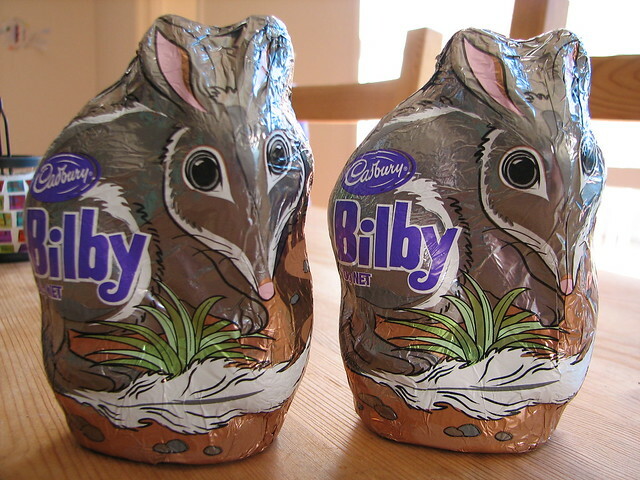 And then, through the torn boxes and rejected chocolate bunnies that were the day before Easter Sunday, I spied these little bilbys and I abandoned my trolley and bag to scoot across to grab them. I may have uttered a symbolic hunting cry slash shriek, narrowed my eyes menacingly , had laser beams blast out my eyes and run in slow motion too but that might just be my internal soundtrack and edited memory. However, this elderly lady and her grandchild moved across my path and appeared to be reaching for the eggs. I picked them up over my shoulder, slapped them on both cheeks, spun them around on my outstretched arm and threw them through the air where they luckily bounced on strategically placed trampolines and fell dazed and defeated to the floor. Or, as I was gathering my strength for this proven action move, they moved past the bilbys and picked up Moshi branded eggs and all was well. They still have no idea how close to danger they came. If my lovely in-laws don't appreciate those bilbys there will be trouble. Big trouble. We haven't really done Easter eggs in recent years but have invited a couple of little friends (and parents obviously) over tomorrow morning for a BBQ breakfast and an Easter egg hunt. It's not about the chocolate when your kids are this little, but about rabbit ears, and hunting eggs. And you can tell them that Jesus died and rose again and that's what Easter is all about, but goodness and love aren't quite as easy to wrap in shiny paper and put in buckets. Which is a pity obviously but that is a ponderance for another day. Happy Easter to the lovers, the haters and that lovely lady and her grandchild.